Time to start your own Cab Booking Android Application with the advanced real-time booking functionality and this app is one of the emerging and relatively trend booking app which is mainly designed for the professional entrepreneurs to start their own travel agency app online and also for the new entrepreneurs to become the successful in their cab booking app. This Android taxi booking app is designed mainly for the people to make an efficient cab booking app with user-responsive and mobile friendly customization. The Taxi and Cab Booking App Development has large-scale usage with the better booking user experience and this app is designed as per the user recommend because in the moving world the users don’t have time to wait in line to make their booking and they can get their travel journey from their place without moving any steps this is made with help of the Lyft android app. And also the usage of the smartphone is increased high on large scale, all the user requirements are made on their hand with the efficient apps. So, this makes the user get their real-time travel booking experience app. In this Grab Taxi App Clone, the new user can register their account by submitting the valid username, mail id, and password etc. After successful login, the user can get into the app where they can make the booking by entering the location, where they can get the desired results for the user query. The user can make the booking by seeing the profile details and experience of the travels or cab, the booking request can be submitted by entering the details, date, time, cost, and locations etc. The user can manage their account and also see the booking request list. After completing the journey with the travels the user can share their feedback and reviews. The Grab Taxi App Script also has the travel agency portal where the user can enroll them by entering the travel agency title, service category, license number, photo, bio etc. After the successful registration, the travel agency user can add and manage their services by entering the details about the travels like name, id, traveling charge, photo, bio, business timings etc. It is easy for the travel agency owners to manage their booking listings by accepting the booking request or decline in the simple process. 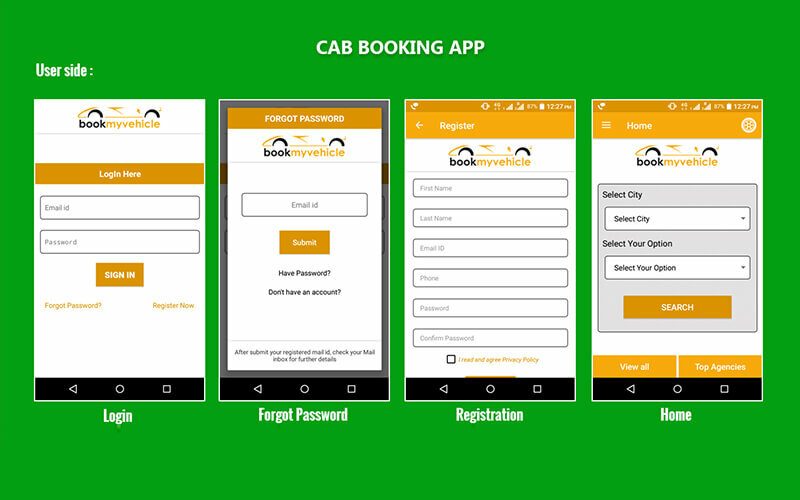 In this Cab Booking Android Application, has the admin portal where the managing and authorizing supreme power is managed by the admin. The admin can have authorized log in individual id and can have the clear display of the dashboard, where can manage the user, travel agency management, booking management, reviews and feedbacks management etc. The admin portal has necessary managing and customizing tools to manage the application with user-friendly. In addition to the app, the PHP Scripts Mall will offer 1-year technical support, 6-months software free update, bug-free code, and mobile-friendly customization. Charming cab app with geo-location integration features. No doubts go with this product, long term business application in cab services. Quick response in mobile and easy to manage the bookings. Design and theme of the app as per my wish as you developed, thank you for it.